Working with an open source platform provides you the limitless opportunities to extend your Web application project. If you are interested in using WordPress for the community elements and Magento for an eCommerce store, then it’s completely possible. No doubt that WordPress is one of the best and easiest platforms to robust your blog in the blogging industry and it is the best tool to integrate with your Magento eCommerce store and very helpful in SEO of your online store. Web developers know that Magento is the best platform to build an eCommerce website and WordPress is the best blogging software. Although, WordPress is also a great CMS for running eCommerce sites some still prefer Magento. There are many ways to integrate your WordPress Blog into Magento store, either you can use Magento extensions to integrate WordPress blog which can be dysfunctional if one of them you upgrade to the latest version or a hybrid solution in which you can add some code to your Magento page, so WordPress post can match with Magento page. There are cool eCommerce themes and WordPress Plugins for shopping cart and Best WordPress eCommerce Themes & Shopping Cart plugin. If you already have a website on Magento and want to convert your same design into a WordPress powered website or in case you to match your WordPress blog with Magento theme for blog integrations. In the above scenarios, you have to modify mostly following WordPress files: header.php, footer.php, style sheet file (style.css) or may be sidebar.php to match with Magento design. Magento themes are little complicated because developers have to change XML file and xhtml files as well. But WordPress themes are easily customizable. For header file all you have to consider <HTML>, <head>, <body>, add site’s logo and navigation links into header file. Keep in mind all the opening and closing div tags, especially the main div must be close in footer.php or index.php file according to WordPress theme. Your footer.php file must have closing </body> tag and </html> tag. The most important part of styles.css CSS stylesheet, you’ll want to include whatever styles you need to make your blog look like your Magento shop. This is the best practice not to duplicate all of the styles in your Magento stylesheet in your blog’s stylesheet. The best way is to import Magento theme’s stylesheets URL into your WordPress Theme’s stylesheet styles.css. One of my fellows have given the solution for creating a custom page in WordPress, but I haven’t created any custom page and achieved the required result by using following steps from Easy WordPress and Magento Integration. 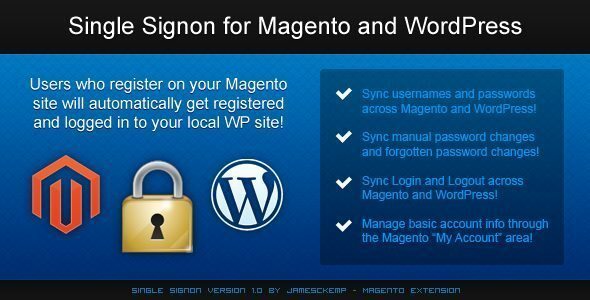 WordPress and Magento must be installed in the same database. Failure to do so may cause unexplained things to happen. FishPig’s WordPress Integration is an extension for Magento eCommerce that integrates your WordPress blog with your Magento store. The extension is compatible with Magento Enterprise, Magento Professional, and Magento Community Edition. Normally all magento websites, which sell products online want a WordPress blog to be integrated with their website, so that they can update news release, PR and fresh blogs on the website on a weekly basis. This is going to be of some real help to novice programmers who are asked to integrate WordPress blog into an e-commerce platform.